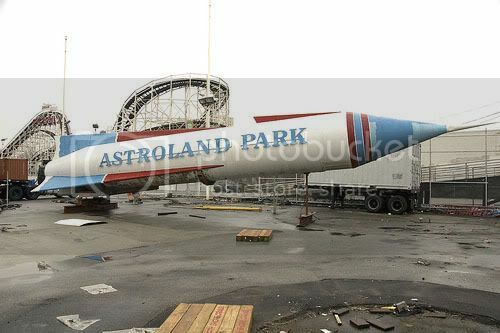 So very sad, the iconic Astroland Rocket has been taken down and will soon be carted away. 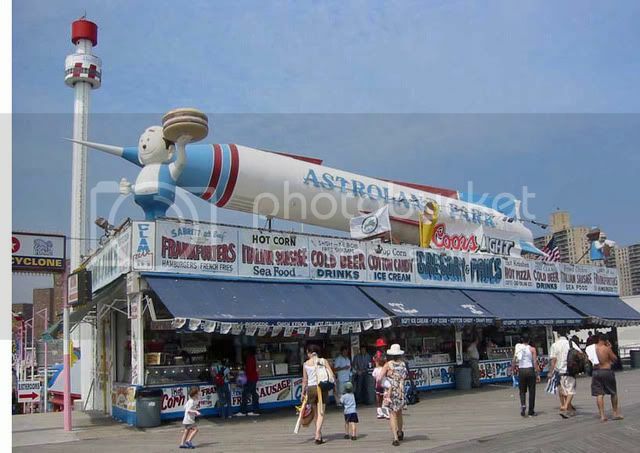 The whole Coney Island redevelopment thing is very sad. What was once a fun, retro get-away enjoyed by many is soon going to be a desolate hole in the ground, mark my words. New York has got to be the worst when it comes to destroying and then failing to rebuild. From the mythical Brooklyn Bridge Park that was to have been completed years ago to the Atlantic Yards and the new home of the Nets to Coney Island. Grandiose plans that fall flat and eyesores that remain for years. It is just a matter of time until Ruby's and Cha Cha's bite the dust. And can the Freak Bar be far behind? What has happened to the Hit Counters. I have two blogs with hit counters from two different sources. They have both disappeared. My brother just posted a blog saying that his has disappeared as well. Is this some kind of a government conspiracy? Okay, I am going to stop with the Jets posts after this. I know that many of my readers don't give a hoot about the Jets. I suspect, however, that they are interested in my emotional meltdowns which the Knicks, and now the Jets, occasionally trigger.